There’s been a lot of debate over the years about the various pluses and minuses of using raised floors for data center cooling versus simply dropping cold air onto the data center floor from ducts on the ceiling. But there’s a third option: the fan wall. 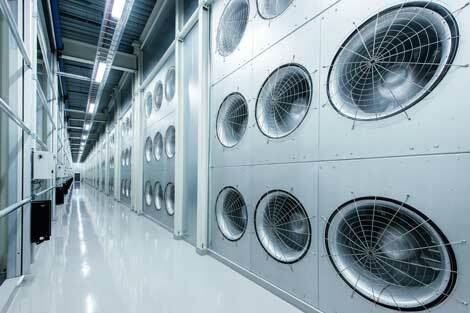 Perhaps the most famous data center operator that uses fan walls in its facilities is Facebook. It has been combining airside economization and evaporative cooling, while using a massive wall of fans to push the cool air onto the data center floor starting with its first company designed and owned data center in Prineville, Oregon. Equinix, the data center colocation and interconnection giant, may be known in the industry for using concrete-slab floors with overhead cooling, but it actually also has raised floors in some of its facilities. Now, the company is trying something new. It is planning to start deploying fan walls in its future data centers. Raouf Abdel, Equinix’s regional operating chief for the Americas, shared the company’s new data center cooling plans in a blog post this week. He didn’t try to argue that the fan wall was better or worse than raised floor or overhead cooling, leaving that discussion until the company has actually seen the fan wall in action. He did list a couple of benefits of the fan wall: you don’t have to pay for overhead duct work or venting under the raised floor, and it leaves more room for equipment, since you don’t have air conditioning units on the data center floor. One drawback of a fan wall is that it can only be used in single-story or two-story facilities. The basic design will consist of an outside wall with cooling units and a fan wall inside the facility. There will be a five-to-six-foot plenum between the two walls that will be filled with cold air. Abdel’s blog post also has a good summary of the industry’s perennial data center cooling debate on raised floor versus overhead cooling. Read more on the Equinix Blog.